Find hotel near Budapest Congress And Wor ..
Hungary has always taken its government pretty seriously. The art of politics has been practiced here since time immemorial and Budapest Congress Center is an example of this. 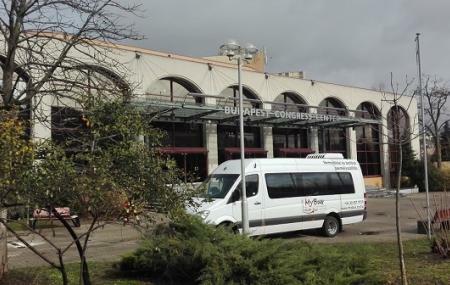 It is the best and most efficient Congress center in Hungary. This place does not only have 4000 meters of exhibition hall spread across the property which has the capacity to accommodate about 2000 people. It also boasts of 20 multi functionality rooms and should definitely be seen when in Budapest. Make sure you visit the place during the guard change ceremony. For the interior, ask the authorities of the place. Timings for interior visit may differ. Check the official website for the update. How popular is Budapest Congress And World Trade Center? People normally club together Vajdahunyad Castle and Liszt Ferenc Square while planning their visit to Budapest Congress And World Trade Center. People also prefer to start their day with Budapest Congress And World Trade Center. A great event venue for any occasion you can imagine. Parking can be a problem, because of the popularity of the place itself. Can seat a lot of people, classy and has friendly staff. The event (Danny Blue) was not organised well. On the side we could not see much, could not read the face forward single screen, the sound was not good then part of the screen stop displaying info... The show was great but this place was not matching the event and therefore made it not too enjoyable. Saw "Cats" here. Great production, lighting and audio and the venue has great acoustics. Unfortunately the seating is not at all suited to theatre type seating as the seating has almost no angle on it. The seats are almost level so it's just about impossible to see the stage unless you are in the first few rows. There were video monitors on either side of the stage, but if I'm watching monitors I might as well watch the show on TV! I suggest if you want to watch a live show here that you book well in advance, ( we booked 5 weeks before and still only got seats near the back of the room) as seats in the back are really too far from the stage and because there is not enough rise in the seating you will hardly see anything, especially if you are short. There are booster cushions available from the concierge on the 1st floor for children and shorter people. The seats are uncomfortable and since they are connected when someone is moving the whole row is moving together. Parking possibility is weak, there are not enough parking. Acoustic is fine.